You have reached the online home for Neale Marine Transportation & Fleeting LLC based at Mile 178.5 on the Ohio River at Parkersburg, WV. We are third generation family business serving the local and regional marine transportation needs of various industries along the river. With our fleet of 7 boats, we provide harbor service and fleeting for the industries in the region. Our fleet of boats ranging from 850-2200 hp are well suited to handle tows big and small. Our fleeting area is capable of safely fleeting 100+ barges in varying stages of water. 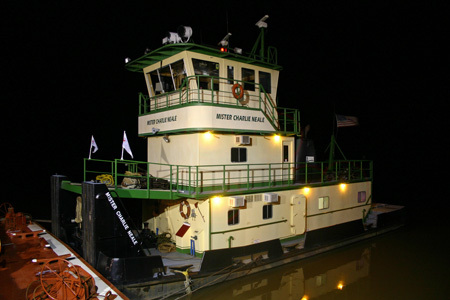 With our drydock and barge mounted crane, we also have the capability to perform repairs on vessels and barges up to 35' wide above and below the waterline. For further details about the services we provide, click the services tab above. Our fleet is located at Mile 178.5 along the Ohio River, with our main office located at the end of 60th St in Vienna, WV. Security procedures in place require us not to allow access to our facility to anyone other than employees without prior appointment.